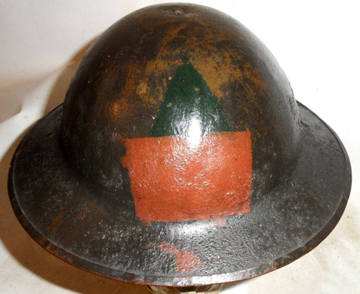 While it became more common after the Armistice than during the War, many CEF units had their regimental or arm of service badge or their unit battle flash painted on the front of their steel helmets. 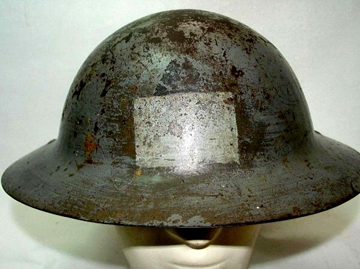 While there is photographic evidence but virtually no documentation of the practice before 11 November 1918, the end of hostilities brought on a flurry of helmet painting. 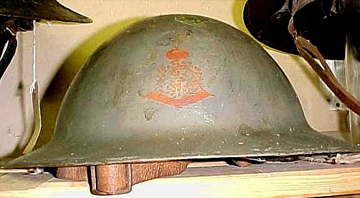 For example, the GOC 1st Canadian issued a circular on 23 November 1918 which instructed Battalion COs to have their unit’s helmets painted as soon as possible “…with the old Red Patch and the Regimental crest in any combination preferred by battalions, as it is the most uniform and striking head-dress we have.” The response seems to have been to apply the battalion’s formation patch. 3rd Canadian Division Orders of 27 November 1918 were more prescriptive. 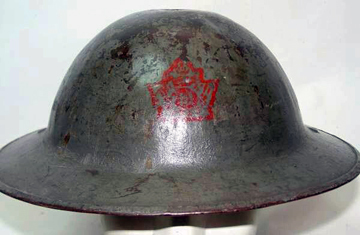 Helmets were to be sent to the central depot and painted grey. The unit badges were to be stencilled at the front. Painted cap badges were in red for most arms and services.. The badges of the battalions in the 8th Brigade were to be painted in red. The badges of 9th Brigade were to be painted in blue. The badges of 3rd MG Battalion and the divisional veterinary company were to be maroon, and the Division’s Signals, Motor Transport and Train in white. The Division’s staff was to apply light blue badges. There were some exceptions to this. At least one battalion, the 58th applied not only its cap badge, but on the back of the helmet its formation patch. 3 Div 58 Bn badge, recto. 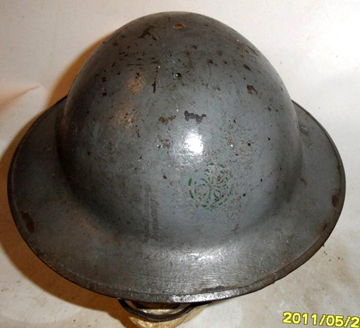 More lavishly, at least some members the 4th CMR mounted their actual brass cap badge on their helmets. 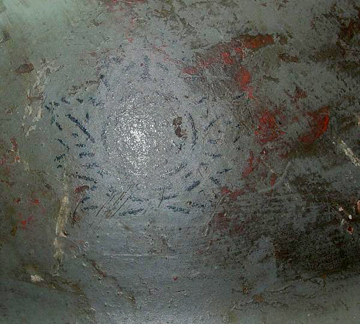 Very interesting details on little known painted insignia on cef helmets. I’m curious about those cef brodies where insignia is painted on one or both sides rather than the front. I read that most of these types were painted over and insignia reapplied to the front according to to hq directives.